Toronto-Based Band EDEN WARSAW Discusses New Music, Favorite Artists and More! 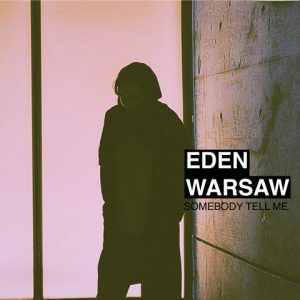 Toronto musician Eden Warsaw recently debuted a new single “Somebody Tell Me” via AXS. Now, via a Punk News exclusive, comes the brand new video for Warsaw’s latest single! “Taking notes from ’90s melodic punk, synth-pop, and the Cure, Eden’s music balances a gauzy rhythm against a soft melancholy.” – view on Punk News now. Previously, Eden Warsaw released his debut 2016 LP Searching For Someone, which spent several weeks on European Pop Charts and received attention from international press and major labels. “Somebody Tell Me” is the lead single from the Warsaw’s upcoming sophomore album Calm The Coast, slated to arrive in the Fall. This year is great so far, thanks for having me by the way! We definitely approached this year a lot differently, last January we played our first show at The Drake Underground and it has been non-stop since then with shows and working on music and new videos. I’m currently sitting on the rooftop patio of my building – no music playing right now just enjoying the weather. When I’m working I like to put on more consistent music to focus, like Tycho for instance. If I’m in a bad mood my go-to lately is Hotel California. I’ve always been drawn to music from an early age that’s for sure. I grew up in a musical household and I would say my true first musical memory is my dad playing ‘Yellow Submarine’ for me on the keyboard and I would ask him to keep repeating it. I’d probably be a doctor. I’d love to help people wherever they’re at in life in some form of therapy, I always say that music let’s me do that today without the PhD. Connecting is key. I always like to ask artists about where they came from and how that city or town has influenced them as an artist now. So how do you think your home of Toronto has affected who you are as a musician and the art that you create? Toronto completely shaped the music, I used to take the train downtown to go skateboarding in the city when I was younger. It was always an escape from the suburbs and seemed massive, especially for skate spots. Now that I’ve been living downtown on my own it takes a completely different shape. 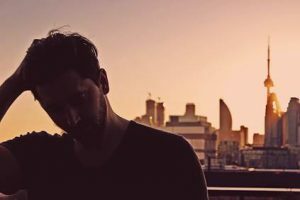 The pace of the city isn’t as fast as it used to seem so I think that comes out a lot in the new material, it’s very introspective with the city as the backdrop. What was the inspiration for your newest single “Somebody Tell Me”? How did it go from being an idea in your idea to a full-blown song? How does this track prepare listeners for your forthcoming album, “Calm The Coast”? ‘Somebody Tell Me’ just happened one night near the end of the album process. I don’t know if I was thinking about anything specifically but I really felt the album needed a point of tension. It’s really a simple song at the end of the day but if people connect their personal experience or emotion to it at the right time, it can be as deep as they want or need it to be. I think those are sometimes the most difficult types of songs to write because you have to have layers that can be uncovered. I’d say most of ‘Calm The Coast’ floats with that mindset as an album, but as a song ‘Somebody Tell Me’ stands on its own. If you ask any of us in the band we all have different favorites, so hopefully everyone can hear them soon. What was it like putting “Calm The Coast” together? Did anything surprise you about the process at all? For sure. I remember driving around the city with Troy one night to show him 10 or more instrumentals I was working on as the foundation of the new album. I would basically explain what I’m thinking in terms of additional instruments and sing choruses or verses I already worked on. Then after I thought I was done writing the album, I kept writing and writing. None of the songs from the drive that night made it onto ‘Calm The Coast’, it just became a completely fresh and new idea out of nowhere. How do you think you have grown as an artist since your 2016 debut album, “Searching For Someone”? Or what has stayed the same for you and your music-making process? I think the songwriting has definitely matured, ‘Searching For Someone’ was written and recorded long before it was even released. ‘Calm The Coast’ has much more of a consistent album theme to it. I really consider it to be the true debut album. In terms of what stays the same, I would say one thing is never copying what’s trending because you might miss out on writing a great song if you go down the beaten path, and two…all I need is a pair of headphones and some time and I can get working on the next album! No tour dates as of yet. We do want to hit the road soon and have been practicing 3 times a week for 18 months now…so we’re definitely ready to go but we are focusing more on the single roll-out and trying to plan when to drop the album, or who to release it through. Guitar wise, John Frusciante is my favorite guitarist. I think if I only played guitar I’d love to do what he did in Red Hot Chili Peppers. So many classic albums in my opinion. I’d really like to work with Kanye though. I feel like we could find some intense middle-ground of music that hasn’t been explored yet. I think your question says the answer. Hope. I always try to have a glimmer or hope in the songs no matter what the theme is and I think people always need hope no matter what. Stylistically, I want people to really understand the mesh of alternative, electronic and pop and how that has remained consistent. I want to give people something a little bit different so that it keeps things fresh, and maybe has a hint of nostalgia to it. Keep your head up. Not everyone will like what you’re doing or understand it at first – especially if it’s not what’s ‘in’ at the moment. That’s not what matters. You’re looking for the people that connect to your music, don’t try to convince the others. That’s what makes music timeless. We hope to get the album out to you soon! !